None. They always surrender before they finish the job and never tell you why. HOW MANY CENTAURI DOES IT TAKE TO SCREW IN A LIGHTBULB? lightbulbs at our slightest whim. HOW MANY VORLONS DOES IT TAKE TO SCREW IN A LIGHTBULB? WHAT IS WORSE THAN A ROOM FULL OF ANGRY NARNS? 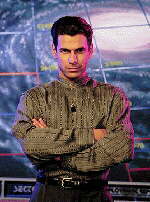 One Narn with the key. They are sworn to defeat wrong! For the Entel'Zha tells me so! Lyta had a little Vorlon. Her skin was pale as snow and everywhere that Lyta went her Vorlon was sure to go. Scorp's Babylon 5 Super Site! 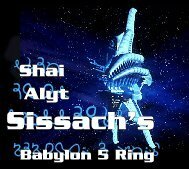 Want to join the Shai Alyt Sissach's Babylon 5 Ring? ThisBooji's WebRing! site owned byAmber.